From Technology To Ochlocracy On The Morning Bus! Over the last couple decades a lot has been accomplished regarding the recognition of the handicapped in needing to get around as much as us abulatory folks do. Hence the Americans With Disabilities Act of 1990. Essentially it established in law that there should be no discrimination of the handicapped and that there should be reasonable accomodation to allow the disabled to get around in society. Title II of the act was more specific in applying the law to public entities like local governments, who also handle public transportation. For the most part the more visual change to our society in the beginning was the construction of wheelchair access to buildings and the lowering of sidewalk curbs at intersections to allow wheelchairs (and those electric chairs) to cross the streets. Over time more changes and adaptations were made to allow for easier access by the handicapped. One of the more interesting adaptations has been in public bus transportation. As I have mentioned in other posts, I have have been forced into taking public transportation for the first time since I was a youngster in Chicago a millenia ago. One of the first changes I saw was that someone actually made boarding a public bus easier for wheelchair handicapped people. What I found amazing was all the technology and design that went into getting all this to work. Being one of those guys who likes to explore the mechanical and electrical design side of things I had a level of respect for all the thought that went into getting a wheelchair from the sidewalk up into a bus… and back again. For one thing buses “kneel”. I first saw this process some years back before the wheelchair ramps entered the picture. The idea is that at a bus stop the right front of the bus can lower (pneumatically or hydraulically) to curb level thus allowing for easier access to the elderly (or others) who used canes, walkers, and crutches. 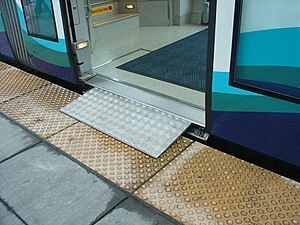 Since I have starting taking the bus I see that there is also a ramp that can fold out and lower to curb level to accomodate the boarding of wheelchairs and motorized chairs. All the use of pneumatics and hydraulics and ramps, etc. called to mind those cable TV shows where inventors would build robotic devices and mechanical add-ons to vehicles. Anyway, now that the handicapped seem to have full access to public transportation there are some other oddities that have surfaced. The one obvious one is that inside the bus there is less passenger space because the ramp mechanics has forced the front wheel wells to protrude into the passenger area. Also, there is usually accomodation for a couple seats to be flipped up to allow a wheeled chair to scoot out of the aisle, one chair on either side (I am guessing if a third wheeled chair wanted to board the bus the driver would have to decline their entry). The other requirement is that the driver has to leave his chair to assist the wheeled chair into place, and to attach to the chair special belts in order to restrain the chair from moving around during motion of the bus. This obviously means the driver has to take time away from driving and meeting scheduled stops (one driver I talked to said if he had a half dozen wheel chair passengers over a given route he could be delayed up to 30 minutes overall). As you know, when passengers are delayed that does not make a driver’s day any more pleasent. Ochlocracy is the fancy Latin term meaning “mob rule”. I’ve witnessed some events on a bus where the passengers seemed to be on the verge of casting some problem person (unruly or so totally spaced) off the bus and under the wheels. While it’s true that one might presume that there’s an extension of maritime law that acknowledges the bus driver as captain of the vehicle as if he were a captain of a ship (I am unsure if the bus driver can perform marriages legally… even in Vegas), sometimes the passengers can get quite vocal in their discontent. Such an incident occurred the other morning as I was schlepping to the local Wal-Mart. The bus had already been late in arriving at my bus stop and when I boarded the bus there were already mumblings amongst the populace about the delay and people being late to their destinations. As we approched one bus stop to take on boarders a couple of passengers moaned slightly when they saw a gentleman on one of those electric scooter chairs. The driver opened the doors, told the couple abulatory boarders to step away from the ramp, then hit the switch to lower the ramp. What followed was a complicated situation. 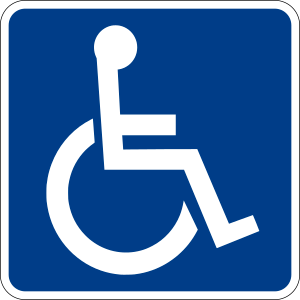 If a handicapped person is to a point where they need an accompanied care person the bus company even extends the special discount rates to them as well… thus recognizing the need that some handicapped people might need the care of a second person. Well, in this case, the gentleman in the scooter could not effectively communicate his desires nor could he navigate the controls of his scotter to get onto the bus nor maneuver into the tight space once on the bus. He lacked coordination and apparently mental awareness of his situation. How exactly he even made it to the bus stop is a question in itself. An already agitated group of passengers became further agitated as the bus driver, in growing frustration, tried to convey commands to the gentleman to get him inside and belted in place. One woman a couple seats over yelled to the driver to just let the guy off the bus. Another woman near the front vented, “He shouldn’t even be on a bus. Get him off.” After a good ten minute delay the driver got the gentleman secured. God only knows where the gentleman ended up going down the line because no one could understand where he wanted to get off. I typically get off the bus at some non-descript bus stop where you usually have to pull the cord to request a stop… and then I am the only one who gets off. Given the tension in this crowd I was a little hesitant in pulling the cord for fear my desire to leave would delay them further to a point where I’d be ejected by force while the bus was moving. But, alas, no one even uttered a discouraging word when I pulled the cord. This entry was posted in Social Issues and tagged Americans With Disabilities Act of 1990, Bus, Business, Chicago, Disability, Ochlocracy, Vegas, Wheelchair. Bookmark the permalink.